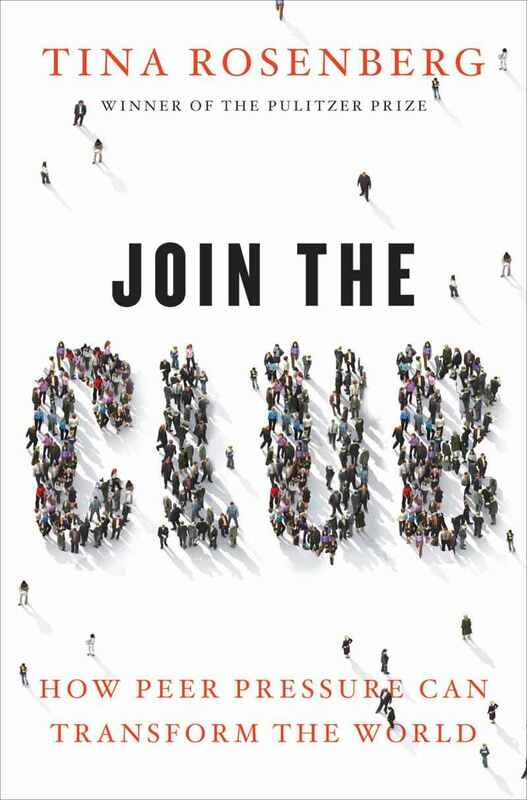 Pulitzer Prize-winning journalist, MacArthur “genius grant” winner and New York Times magazine writer Tina Rosenberg has a new engaging book out called “Join The Club: How Peer Pressure Can Transform the World” about how peer groups and their social ties can be used to cure social problems (“the social cure”). She chronicles peer groups that spread information and promote positive lifestyles for group members; examples include how Florida fought teen smoking through teen groups taking on tobacco companies through the Truth Campaign; how students effectively protested against Serbian dictator Milosevic by using street theater in a group called Otpor; how LoveLife, a peer group in S. Africa, made AIDS awareness part of an aspirational lifestyle for teens; how the Chicago-based Willow Creek Community Church tries to change lives over small neighborhood-based Table groups; how a village-health worker group in Jamkhed, India is teaching Untouchables to have self-respect; how a peer-based group successfully taught calculus to poor Latino students (“Emerging Scholars“) through nightly study groups; and even how a community drop-in center in Brixton, England for Muslim teens might be effective in anti-terrorism efforts in the UK. We applaud Ms. Rosenberg on her campaign although much of this “social cure” is old wine in new bottles. Sociologists have known for a long time how social settings can effect our choices for good or ill (see experiments of Asch or Milgram). And many groups for a long time have thus used the power of peers to increase their effectiveness. This is after all why many weight loss groups are formed (because the social bonds help people keep weight loss promises) or why Al-Anon uses 12-step group methods to overcome addictions; it is why micro-lending programs (like the Grameen Bank) are organized in groups (to increase repayment rates). Basically these groups are using social capital. Social Capital achieves its impact through five main paths: 1) providing increased access to information (like learning of potential project partners or job leads); 2) providing increased sense of meaning that individuals find from social engagement; 3) developing stronger group social norms (e.g., I do something that I might not on my own because I’m worried about my social standing in the group) that members feel pressure to conform to; 4) aiding reciprocity (e.g., I do something for someone else in the group now without expecting any immediate repayment because I expect that they, or someone else will do something for me down the road); and 5) the facilitation of collective action (just jargon for saying it makes it easier to do things that require collaboration and concerted response). The power that Rosenberg finds in “peer pressure” in these various groups is primarily a function of these paths. For example, people in a weight loss group stick to their weight loss regimen better because they care about others in the group and what they think and they worry that they will sacrifice these friendships or be embarrassed if they have to admit in the group what caloric foods they snacked on or how they missed their weight loss target. What is perhaps new or unusual about the book is the acknowledgement of the role of marketing and Rosenberg’s belief that the message has to be positive. First, marketing can be a powerful reinforcer of group ties and social norms and the desire to be in a group in the first place. In the South African , although AIDS awareness was a primary goal of LoveLife, they didn’t wear this on their sleeve. Countless billboards, public service announcements, games and concerts got teens convinced that being part of LoveLife was important. Teens often exhibit flock tendencies, where the desire of doing something rises as the number of your peers are doing this as well. LoveLife benefited from this, and AIDS awareness was a less visible but core part of the LoveLife message. It’s unclear what the relative weights were on the attractive message and marketing, the friendships, and the social norms in what got people to join, stay with and achieve LoveLife goals. A second one of Rosenberg’s messages is that the approach has to be positive and not based out of fear. One has to make joining hip and fun rather than like castor oil or broccoli. We argued something similar in the BetterTogether report. As Rosenberg notes, “If you want to help someone change their behavior to accomplish a social goal, don’t give them new information and don’t use appeals based on fear. The most effective way is to provide them with a new peer group of people who they can identify with and who can hold them accountable. If you can get people to be active and to overcome their fear, fatalism and passivity, then you’ve gone a long way towards what you want to do.” Rosenberg acknowledges that she didn’t invent the power of groups, but she thinks they could be more widely used and enhanced with these positive lifestyle messages, maybe even for something like tackling global warming. This approach has its merits, although it should be noted that there are many successful groups like “Mothers Against Drunk Driving” (MADD) that were not about forming a positive lifestyle “Mothers For Sober Drivers” but aligned in their opposition to an evil, so it’s not clear that Rosenberg’s “be positive” message helpfully describes what efforts succeed or fail. Rosenberg believes there are limits to the “peer pressure” approach. It is time-consuming and she thinks it is less effective at persuasive education about societal facts and trends. Rosenberg acknowledges that “peer pressure” has gotten its bad image because much of what teens use social pressure to enhance are negative goals: pressure others to buy Ugg boots or silly bandz, or bully an unpopular schoolmate, or pressure other teens to use drugs. Although she stresses that outside groups (non-profits or government) could use this peer pressure for good, corporations or non-profits could just as well use it for negative ends, something that we openly admit in our writings and Bob (Putnam) has discussed in Bowling Alone. And social groups might help promote goals about which there is societal disagreement: teens might be urged to join small religious groups to promote”covenant marriage” (sticking with a marriage even when things get really bad) or to put pressure on teens not to get an abortion, or a corporation might use social networks to sell more products. This entry was posted in better together, Emerging Scholars, Join The Club, lifestyle, LoveLife, MADD, Mothers Against Drunk Driving, Otpor, peer pressure, positive peer pressure, social capital, social cure, social norm, social norming, social norms, the social cure, Tina Rosenberg, Willow Creek Community Church and tagged better together, Emerging Scholars, Join The Club, lifestyle, LoveLife, MADD, Mothers Against Drunk Driving, Otpor, peer pressure, positive peer pressure, social capital, social cure, social norm, social norming, social norms, the social cure, Tina Rosenberg, Willow Creek Community Church. Bookmark the permalink. I will definitely read the book. I think Rosenberg is onto something. But the flip side of such groups is that they also tend to engage in groupthink, that positions held prior to joining tend to become more extreme when in a hothouse atmosphere with no dissent and members looking to each other for affirmation. Lynch mobs are such groups. So is the Westboro Baptist Church. Diversity of thought is critical for having checks on groupthink. But I’m willing to let Rosenberg convince me otherwise.